Manchester United kicked off the 2018-19 Premier League season with a 2-1 victory over Leicester City at Old Trafford on Friday night. Paul Pogba scored from the penalty spot inside three minutes after Daniel Amartey had handled a blocked effort from Alexis Sanchez. Luke Shaw sealed the game eight minutes from time with his first goal as a professional. Jamie Vardy scored a consolation for the visitors in stoppage time after Ricardo Pereira’s cross come shot came back off the post and rebounded in off the striker. After much negativity from the media over the past couple of weeks Jose Mourinho will be pleased with the three points, particularly with the lack of preparation time since the 2018 World Cup, which was displayed by the number of first team players missing from the first team this evening. David de Gea 7 – Fine stops to deny James Maddison after half hour and Demarai Gray with 15 minutes to go. Otherwise our defence protected David de Gea very well until Leicester scored in the 92nd minute. Matteo Darmian 5 – Leicester City had good success down our right early on. Matteo Darmain looked scared to challenge Demarai Gray and didn’t get much support from Juan Mata in front of him in the first half but came on stronger in the second half. Eric Bailly 8 – Solid at the back in denying Kelechi Iheadnacho a couple of times. James Maddison from midfield was the only Leicester player to get a notable effort in on target. Victor Lindelof 6 – Bailed out by Eric Bailly on two occasions and will be grateful that Kelechi Iheanacho was useful this evening. Luke Shaw 8 – Got forward from left-back at times but didn’t put a single cross in the box. Laid the ball off to Sanchez moments before we won our penalty. Relatively comfortable game defensively against Ricardo Pereira and Rachid Ghezzal. Nervous moment in conceding possession to Jamie Vardy late on before scoring with a fine finish to seal the game in the final 10 minutes. Fred 7 – Good in possession and made a few tackles in the middle of the park. Didn’t do much wrong in an energetic display on his debut. Paul Pogba 8 – Some lovely passes including one to release Alexis Sanchez midway through the second half. 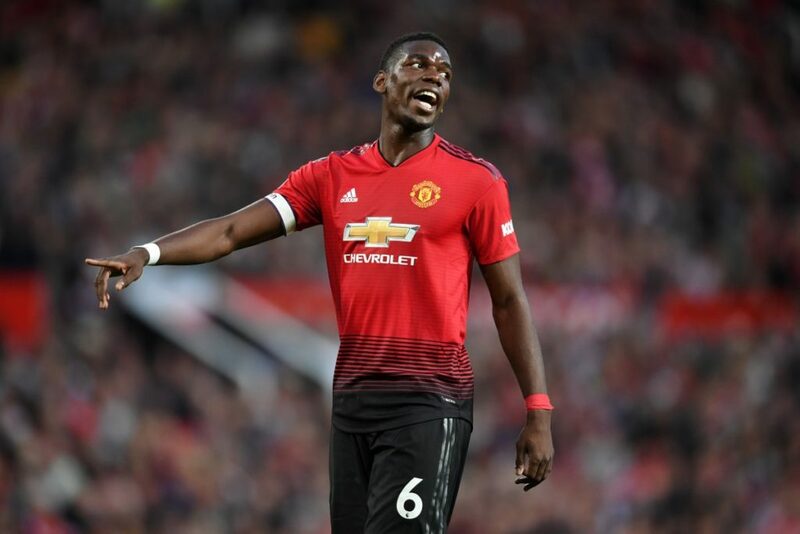 Paul Pogba made some important headed clearances from set pieces that were often aimed towards Harry Maguire. Scored the opening goal of the 2018-19 Premier League season. Juan Mata 6 – Didn’t stay with Ben Chilwell as the young Englishman bombed on from left-back. Saw an effort from 20 yards deflect narrowly wide in the second half. Not a hugely influential game from Juan Mata until the final few minutes which included setting up Luke Shaw’s goal. Marcus Rashford 5 – Often held up the ball instead of driving at defenders to get an effort in on goal. Marcus Rashford didn’t test Kasper Schmeichel once as the starting striker, though did spend some time out on the right wing. Replaced by Romelu Lukaku midway through the second half. Alexis Sanchez 5 – Lots of poor touches and incomplete passes in a sloppy game from Alexis Sanchez. Although the Chilean’s effort won our penalty, he really should have had a much better game down the left against Daniel Amartey who was off colour. Romelu Lukaku (24 mins) N/A – Saw a one-on-one well denied by Kasper Schmeichel in the final quarter-of-an-hour. Romelu Luakku didn’t see any other action either side of that. Scott McTominay (15 mins) N/A – Replaced Fred late on to help see out the victory. Marouane Fellaini (7 mins) N/A – Came on for Paul Pogba straight after we went 2-0 up.